The popular 13-inch MacBook Pro has been updated with Retina Display, while 11-inch and 13-inch MacBook Air have been updated with latest processors and graphics. Apart is launching a new Macbook and smart watch, the company has also announced updating its current MacBook Air line up. The 11-inch and 13-inch MacBook Air models have been upgraded with the fifth generation generation Intel Core processors up to 2.2 GHz, with Turbo Boost speeds up to 3.2 GHz, integrated Intel HD Graphics 6000, and Thunderbolt 2, delivering up to 20Gbps. The 13-inch MacBook Air comes with faster flash storage that is said to be two fold faster than the previous generation. The 11-inch version (128GB SSD) starts at Rs. 65,900, the 256GB SSD costs Rs. 79000. The 13-inch MacBook Air 128GB SSD) has been priced at Rs. 72,900, the 256GB SSD costs about Rs. 86900. Apple has also updated its 13-inch MacBook Pro with Retina display with the Force Touch trackpad, fifth generation Intel Core processors and Intel Iris Graphics 6100 and longer battery life. 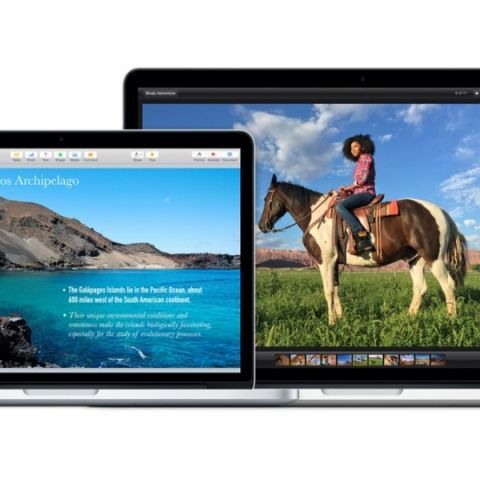 The 13-inch MacBook Pro with Retina display is priced at Rs. 94,900. The one with 256GB SSD will cost Rs. 1,09,000 while the variant featuring a 2.9GHz Core i5 processor, 8GB of RAM and 512GB SSD is priced at Rs. 1,29,900.